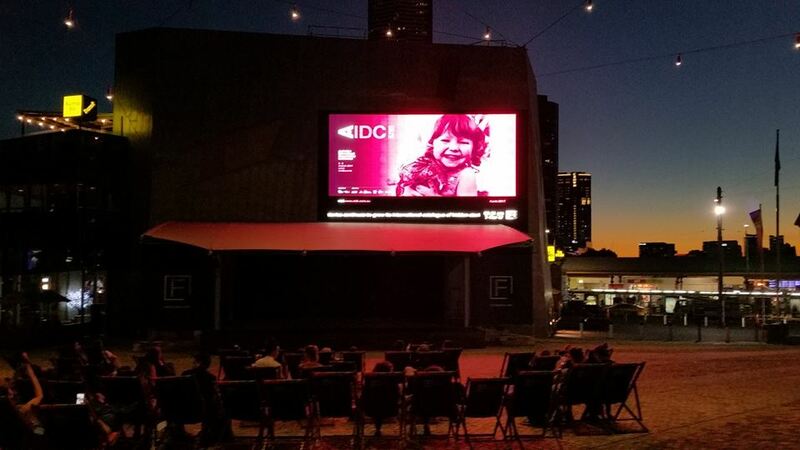 The recently concluded Australian International Documentary Conference (AIDC) in Melbourne featured both cutting-edge and enduring features of the lively Australian documentary business, which depends on government grants to the creative sector, commercial TV's bottomless appetite for reality, international markets and of course, sweat equity. For 30 years, the AIDC has been, as former director Heather Croall puts it, "the annual pilgrimage" for Australian documentary directors and for international programmers, distributors and marketers who work with them. (She was there with a new personal film, about her father.) This year, under the new direction of veteran documentary filmmaker Andrew Wiseman, the conference drew more than 700 participants from 14 countries, although the great majority were Australian. They could daily be seen networking and in huddled meetings with potential backers and distributors in the café of Melbourne's elegantly designed, conference-casual Australian Centre for the Moving Image. "Australian production is so exciting these days," said Mitzi Goldman, head of the Documentary Australia Foundation. "People are learning new production methods, finding new partners, and new voices are surfacing. The work of aboriginal women filmmakers alone has been extraordinary." At the pre-conference on virtual reality, the star was Navid Khonsari, a New York-based Iranian-Canadian who brought his chops earned working on Grand Theft Auto to the making of a social-history game about the 1979 Iranian revolution, 1979 Revolution: Black Friday. "Ninety-five percent of all social issue games fail," he maintained, because the makers and the users aren't in sync. He urged iteration, user feedback and team-building to ensure that aesthetic and design talent build a compelling experience. Australian artist Lynette Wallworth, whose striking VR project Collisions was part of the 2016 Tribeca Film Festival, reminded the audience that VR can be used to manipulate or for connection: "I want to use VR to help you connect to the person and their story; my craft is the work of providing context, sculpting the intimacy of encounter." For many filmmakers, however, today's biggest challenge is still getting airtime. A session with Australian broadcasters surfaced a reality to anyone who has ever attended Realscreen in the US: Broadcasters are looking for reality programming with low budgets, familiar formats and the potential to generate many, many episodes. This is even true for tiny National Indigenous Television (NITV), since 2012 affiliated with SBS, Australia's TV service that includes immigrant and minority voices in "Australia’s story." And yet most filmmakers were there with one-off passion projects, often about Australian heritage and the underrepresented. The contrast between the scale of their projects and huge sports- and celebrity-themed efforts such as those of UK producer John Battsek and Ezra Edelman's O.J. : Made in America - they conducted a stimulating conversation about sports and culture - was stark. For some of the makers, airtime is only one of the challenges in getting a socially engaged project to make a difference in the world. For them, a panel on "impact producing" was a must-attend. Filmmaker and impact producer Alex Kelly coordinated the panel (in which I was honored to participate), which discussed best practices in strategic planning for impact with social-issue work. Among other things, Tim Norton of Digital Rights Watch, who works with Save the Children and other major nonprofits, noted the importance of understanding the positions that potential partners hold, to ensure that values and messages match up. Rebecca Barry of MediaStockade, where work on the documentary The Opposition blew up into major controversy, discussed managing the unpredictable. US director/producer Nancy Schwartzman's keynote also addressed impact. Talking about the popularity of metrics drawn from apps and social media, she noted that producers could put both subjects and users at risk by sharing "big data" with funders and others interested in levels of impact - even when supposedly anonymized. With her app Circle of 6, which emerged from her documentary focus on violence against women, she collects no data on users. She is also upgrading encryption on the app and enhancing other privacy measures on it. The emerging digital-video environment, constantly changing and still with limited returns to producers, was also in focus. A hero of the day was The Guardian's Charlie Phillips, who commissions online video for international distribution on the newspaper’s site; he gave a presentation showcasing some of the most successful projects. "This is a particularly great venue," he said, because "given the size and diversity of the stories here, only local filmmakers will have access to the brilliant people and stories that will work for us." He signaled the key elements that make a film project a good match with The Guardian: Ambitious; designed to be watched online; contemporary; visually bold (on the small screen - that's really, really important); subtitled (yes, you want your viewers to watch with sound, but maybe they can't); easy to share. Finally, in two closed workshops where producers could frankly discuss challenges in production, Kingston Anderson, head of the Australian Directors Guild, and I heard stories of filmmakers coping with one of the world's most restrictive copyright regimes. Australian directors routinely expect to pay thousands of dollars for work that in many other countries, including other Commonwealth countries, they would use unlicensed. They are struggling with what recommendations to make to their government that would also maintain their income from licensing. Patricia Aufderheide is a 2017 Fulbright Senior Scholar at Queensland University of Technology and professor at American University in Washington, DC.